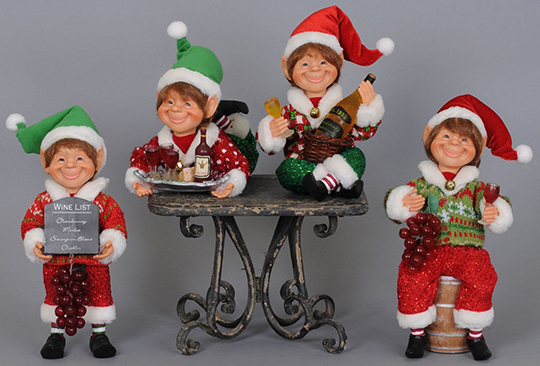 The Karen Didion 9� Four Piece Wine Elf Assortment is great for any bar, kitchen, and countertop. The quality is unmatched with these decorative pieces� hand-painted faces, glass inset eyes, unique fabric, and detailed accessories. With each elf�s unique and jovial design and wine themed attire and accessories, this Christmas set is great as a gift or as a decoration for your own display. These collectibles are sure to add character and style to any home. Elves must be purchased as the set of four. Stand not included.